Yesterday, I saw a video of a disabled man standing up from his wheelchair to dance with his bride at his wedding. This is not the first of this caliber I have seen–news stories and social media posts are often made about disabled people dancing at prom, walking down the aisle, or walking at graduation despite protests from disability rights activists. While these stories make people cry, seeing a man be supported by loved ones while he dances with his (presumably) able-bodied bride can be emotional, it highlights a disconnect between how disabled people are perceived and how they truly are. Up until recently, the only media coverage of disabled people I saw were remarkable (think Stephen Hawking), pitiful (e.g., disabled people dying at the hands of negligent caretakers), or inspiring (e.g., a seemingly “wheelchair-bound” individual standing). This would be permissible if disabled people were seen more regularly, but as the only coverage, this paints a disturbing picture: disabled people are only valuable when they are conforming to able-bodied standards (in this case, that would be standing); that is to say that their role is to entertain and inspire able-bodied onlookers. I understand that this is not the intention of the people sharing these stories—the presumed intent is to “spread positivity,” but tied with the reality that disabled people are underrecognized, these stories take on an exploitative tone. Only discussing and acknowledging disabled people when they are performing tasks that would be mediocre for able-bodied people sends the message that we are less. We are only relevant when we are modeling able-bodied people or if we are providing others with some sort of entertainment, whether in the form of human perseverance or remarkability. Rarely do I see wedding videos of random able-bodied people standing at the alter; this is commonplace in our society–able-bodied people get married everyday. There is nothing inherently “inspiring” about weddings, and they are only emotional events for the people involved. However, if a disabled person ditches their wheelchair and hobbles down the aisle with the support of friends, people cry. Walking is not a remarkable task for able-bodied people, and while for many disabled people it may be, the ability to walk should not make someone more valuable; yet this is often the message being sent. It has been argued that the people depicted in these stories choose to stand, a valid point; however, when used by able-bodied people, these stories become about “overcoming” one’s disability. Many disabled people, including me, will neither “overcome” our disabilities nor do we intend to. When these stories overflow the media and our consciousness, they affect the ways in which we view and treat disabled people. Up until the 1940s, disabled people were the object of spectacles in “freak shows.” For one-hundred years, disabled people were a source of crude entertainment rather than human beings worthy of respect. P.T. Barnum, the notorious subject of the film The Greatest Showman, used disabled people for capital gain. While Barnum’s “freaks,” were paid for their performances, they were guffawed at by people who viewed them as nothing more than freaks of nature. 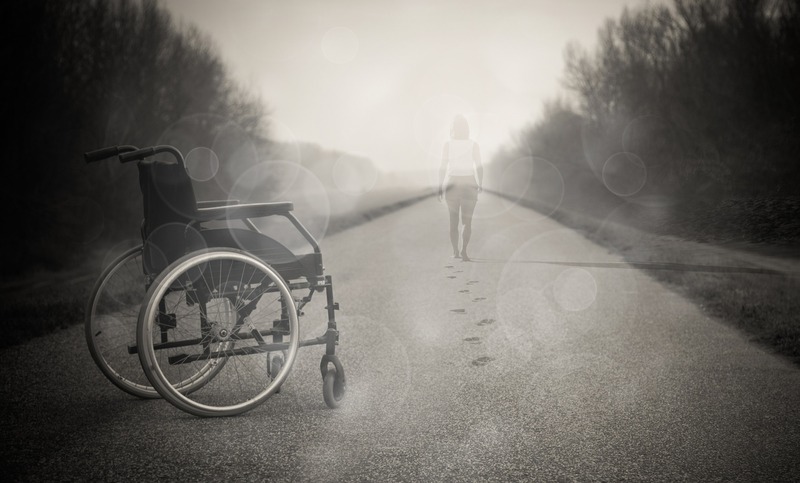 Revering disabled people for ability milestones, such as walking may not be as severe as exploiting their differences in an organized freak show, but the mindset that disabled people are objects for the able-bodied gaze has remained. When I was going out for drinks with a friend once, a stranger told me I was “inspiring.” Luckily for the man, it was before I had a drink, but I did not understand how having a drink with a friend could possibly make me inspiring. Perhaps, he was alluding to the fact that disabled people face more obstacles than their able-bodied counterparts, but that day, I was just a twenty-one-year-old woman having fun, who just-so-happened to be disabled. I did not want to be put on a pedestal; I simply wanted to be treated like a human being. To clarify, I do not fault the man in the video, or any disabled person who chooses to stand at weddings or other ceremonies for that matter; my qualm is with the people who use these stories for their daily dose of positivity. They (unintentionally) are exploiting disabled people, stripping them of their humanity, for their own benefit. They are not looking at disabled people as complex humans, but rather as objects of inspiration. For me, stories about disabled people standing up, illicit the old mindset that disabled people exist to entertain our “normal” counterparts. The stories are usually shared with the best of intentions, but they fail to recognize the humanity of disability. Crockett, Zachary. “The Rise and Fall of Circus Freak Shows.” Priceonomics, https://priceonomics.com.